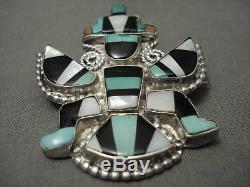 This is an exquisite vintage Zuni earlier 1900's silver pin. This piece contains outstanding inlay that consists of what appears to be Cerrillos turquoise, mother of pearl, and onyx. Surrounding the entire kachina pin are impressive silver works that include raindrops and swirling silver ropes. The pin measures around 1-7/8" x 1-5/8". The item "EARLY 1900'S VINTAGE ZUNI CERRILLOS KACHINA SILVER PIN OLD" is in sale since Friday, April 07, 2017. This item is in the category "Collectibles\Cultures & Ethnicities\Native American\ US\1800-1934\Jewelry". The seller is "nativo-arts" and is located in New Mexico, USA. This item can be shipped worldwide.